A CITY centre business is leading by example as business organisation Aberdeen Inspired’s civic pride campaign continues to gather momentum. Staff from the McDonald’s restaurant on Union Street came together on Monday (June 9) to complete a litter pick of the area surrounding the restaurant, including the Merchant Quarter and The Green areas. 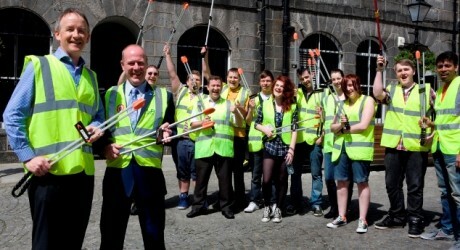 Organised by restaurant owner Geoff Cooper, who is also a director for Aberdeen Inspired responsible for the organisation’s Safe and Secure theme, the litter pick forms part of the organisation’s civic pride campaign that was recently launched in an effort to encourage its levy payers within the BID zone to take responsibility for the cleanliness of the area it operates in. The litter pick also forms part of McDonald’s support for Keep Scotland Beautiful’s Clean Up Scotland campaign, a nation-wide initiative designed to make the country cleaner and greener for all to enjoy. Support for the litter pick came from Aberdeen City Council who provided a range of equipment and helped with the removal of the litter after the clean-up project was complete. Geoff Cooper was delighted with the turnout and is encouraging other city centre businesses to get involved with similar projects. He said: “The litter pick really was designed to allow McDonalds to do its bit for that particular area of the city centre and the staff have really got on-board with what we are trying to do in terms of reducing the amount of litter surrounding our premises. “Aberdeen Inspired’s civic pride campaign is encouraging levy payers to look after their own ‘patch’ and it’s great to be able to be part of this and hopefully encourage some of the other levy payers and businesses on Union Street to follow suit. “Little steps can make a big impression in the appearance of the city centre, in particular on Union Street, and the campaign really is designed to change perceptions and to encourage a sense of pride in the area. Kevin Stewart, MSP for Aberdeen Central, said: “I would urge all Aberdonians to dispose of all of their litter responsibly so that we can be proud of our city’s environment. MEDIA RELEASE issued by Citrus:Mix. You too can post your story ideas for journalists (aka press or media releases), on allmediascotland.com. Email info@allmediascotland.com for more information.